Affordability, value and debt dominate the higher education conversation today. And for good reason. Obtaining a college degree remains one of the best investments in America. Studies consistently show that those with college degrees earn as much as $1 million more over the course of a career compared with those with only a high school diploma. From family dinner tables to political campaigns, student debt is a consistent thread in the discussion. Nationally, student debt levels constantly seem to climb, diminishing life opportunities after college and causing negative economic ripples. With a trend that has traversed a decade, tuition at America’s colleges has headed ever higher in a period of slow economic growth and inconsistent state support for public institutions. How does UVA stack up on issues of affordability and value? Tuition rates receive a sizeable portion of attention around the price paid by students and families for higher education. Research by the College Board shows that in-state tuition and fees at public four-year institutions increased at an average rate of 3.4 percent beyond inflation between 2005-06 and 2015-16. Nationally, the trend sounds alarm bells as rates outpace inflation and cause concern that they push a college degree out of reach of middle-class families or place additional pressure on the use of student loans. The tuition discussion, however, remains incomplete without context about total cost of attendance, including grants and scholarships awarded, and the net price actually paid by students and their families. The federal definition of total cost of attendance includes all tuition and fees, housing, meals, books, supplies, travel and miscellaneous costs. After subtracting grants and scholarships from the total cost of attendance, a student has an accurate picture of the net price of an institution. These grants and scholarships include those offered for financial need, academic performance, demographic characteristics and other purposes. Beyond net price, factoring in offered work study opportunities and need-based loans offers the clearest picture of affordability. 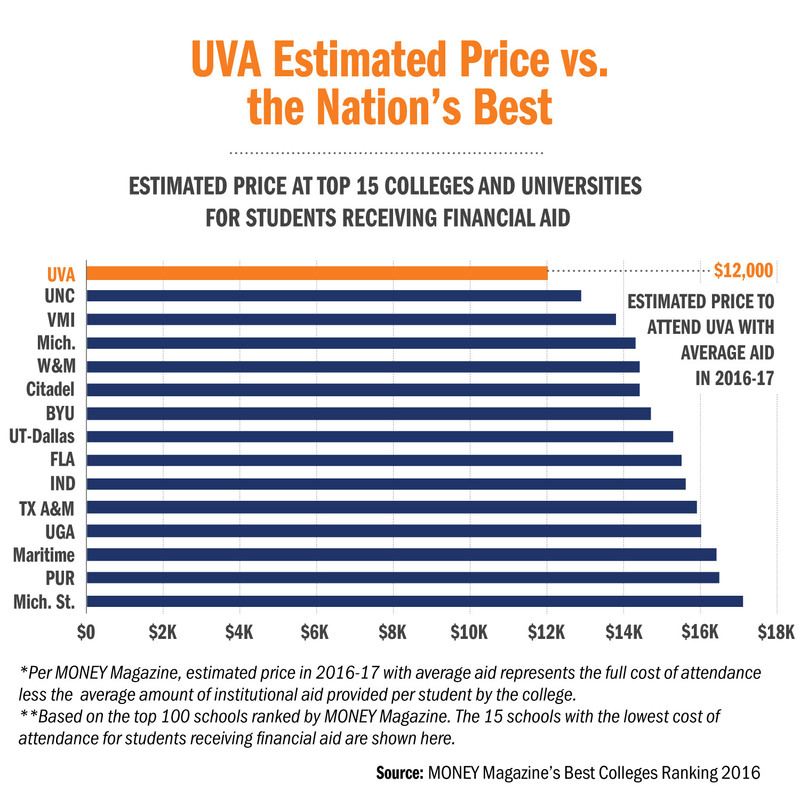 In one independent measure, Money magazine placed UVA at the top of its list of the nation’s best, and most affordable, schools. Its annual review of college quality and affordability recently ranked UVA as having the lowest estimated price after aid in the nation among its list of the top 100 schools. Money’s analysis compared the best universities by their total cost of attendance minus the average amount awarded in grants and scholarships per student, adjusted for the average time it takes students to graduate. 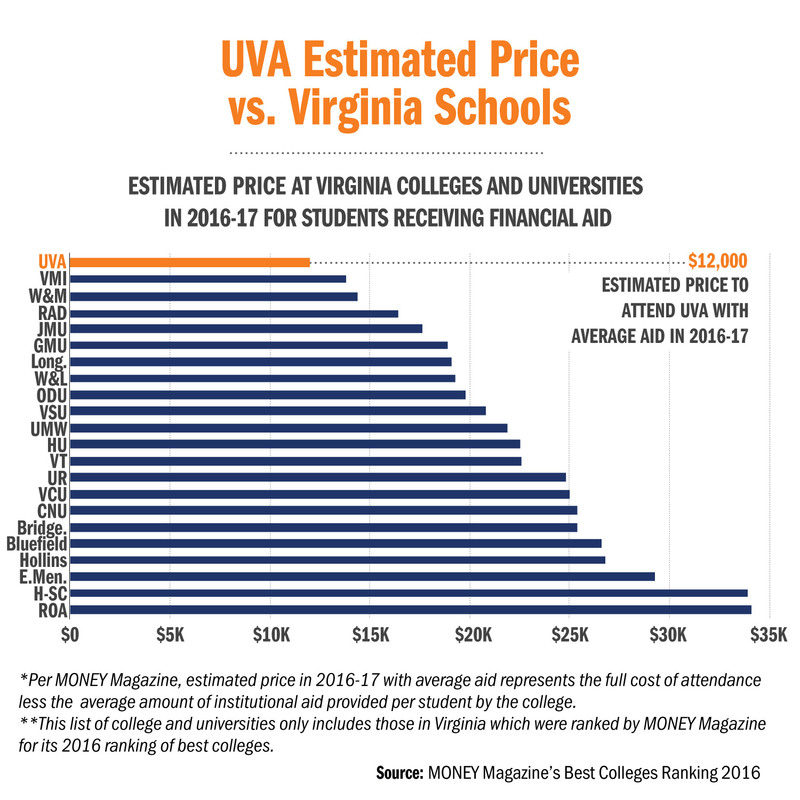 That metric also demonstrated the University’s remarkably low estimated price after aid for 2016-17 when compared to both public and private colleges and universities in Virginia. With the national cost to attend college rising during periods of inconsistent state support and stagnant household incomes, student loans are likely to represent a growing portion of how a family finances a student’s education. Nationally, total student loan debt has climbed past $1.2 trillion. With defaults surging and concern rising about the negative effect of crushing student debt on graduates, the Department of Education last year expanded a program that allows more borrowers to cap their monthly payments at 10 percent of their annual income, regardless of when the loans were taken. UVA leaders have responded aggressively to the debt issue. In 2015, the Board of Visitors approved a comprehensive plan to address rising tuition, debt exposure and to tie future tuition increases more closely to the rate of inflation. The Affordable Excellence program dramatically lowered the maximum amount of need-based loans offered to in-state students and lowers the overall net price for 70 percent of Virginia families. Using funds generated by two $1,000 step increases in tuition, the University lowered the maximum need-based loan offered to low-income students from $3,500 per year to $1,000 per year. For all other Virginia students, the need-based loan caps were reduced from $7,000 to $4,500 per year. The rest of a student’s demonstrated need is met by grants and scholarships or work-study. 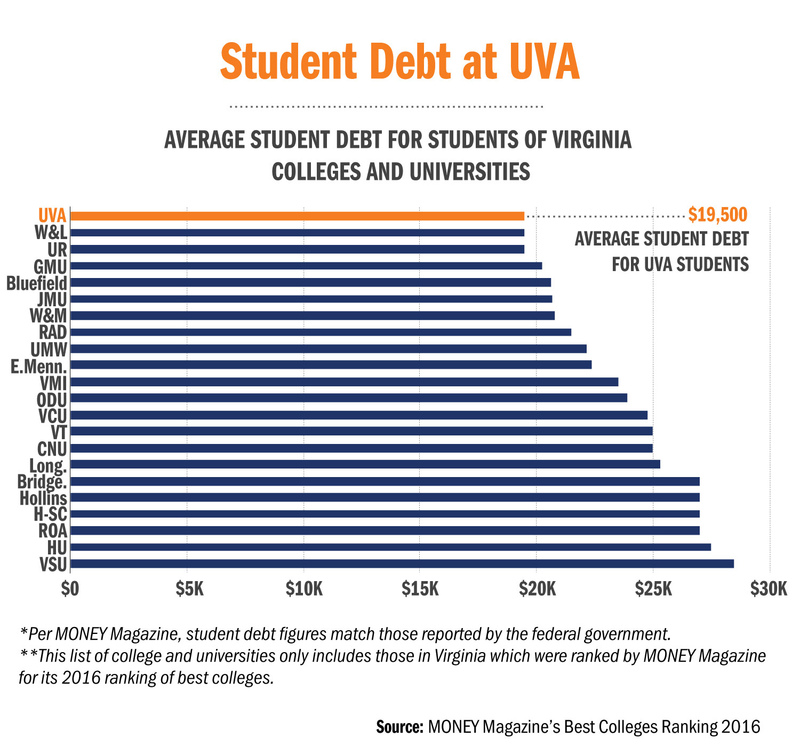 The result: UVA has the lowest average student debt of all schools in the commonwealth. Average costs and projections of grants and scholarships provide useful information for those mulling college choices. They also offer reasonable tools for families to compare estimated net price among colleges under consideration. Averages, of course, don’t reflect individual family scenarios. 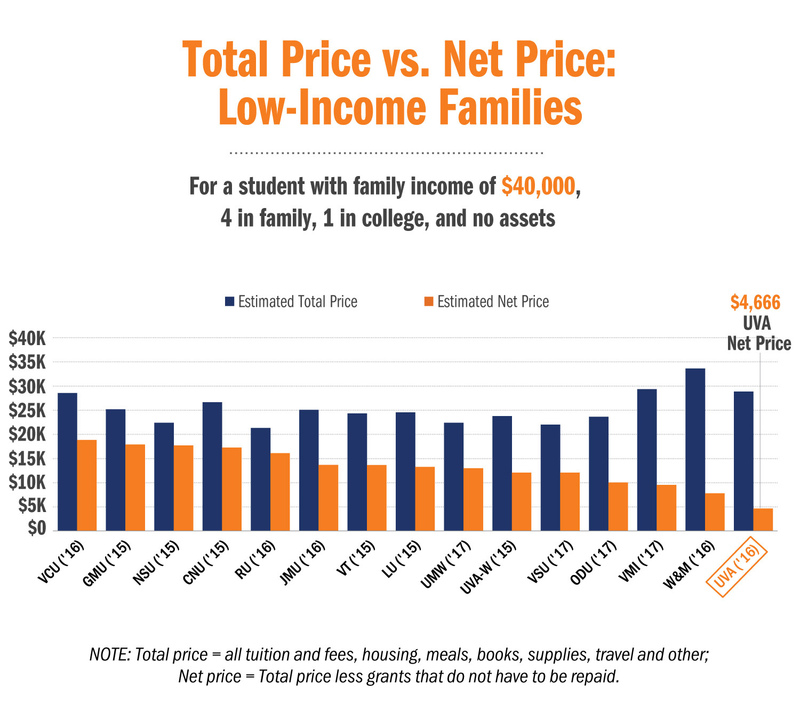 For families with the highest financial need, UVA offers an education for the lowest net price among Virginia public institutions. 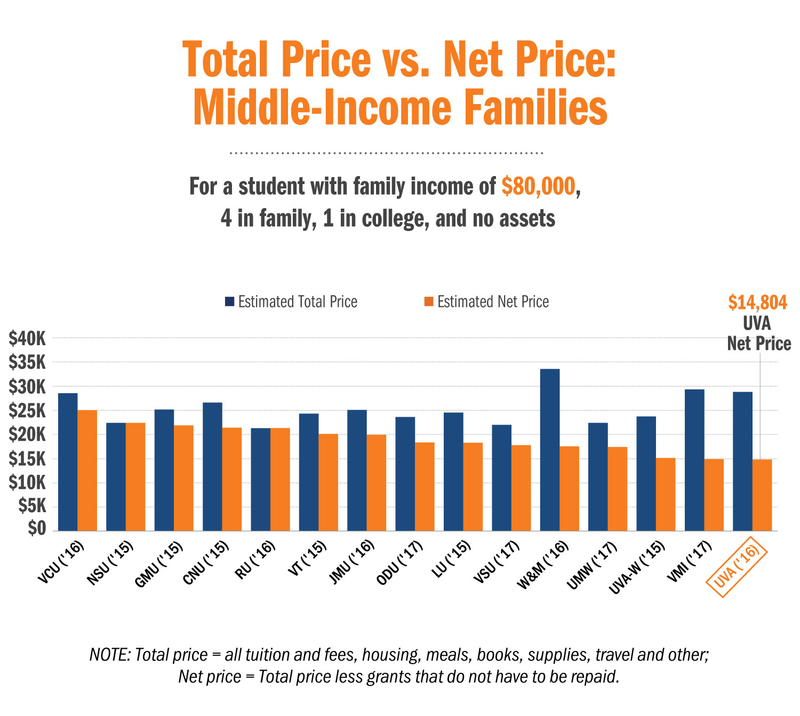 For middle-income Virginia families with an annual income up to $80,000, four family members and one college student, UVA again offers a compelling bargain among state peers, based on net price. Net price, however, does not include the effects of work-study or need-based loans. 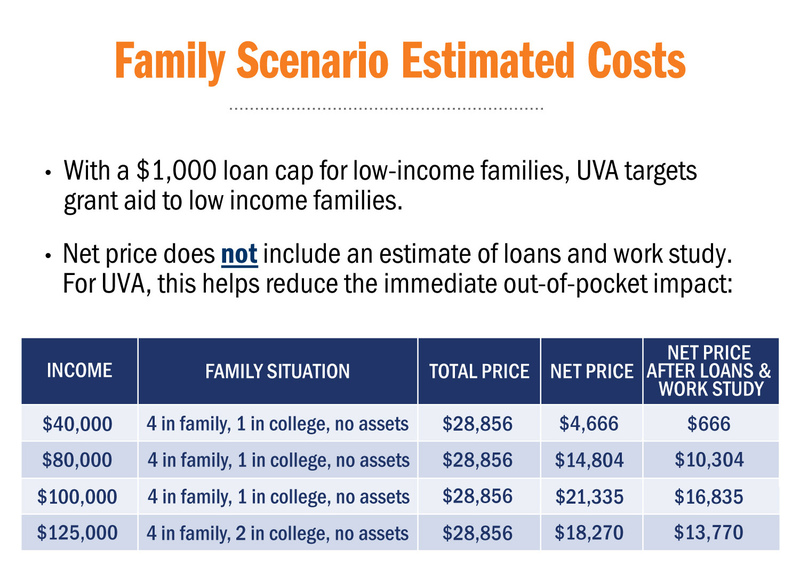 This table demonstrates how net price at UVA reduces even more once work-study and need-based loans are entered into the equation – further minimizing the immediate out-of-pocket impact for families. Among the country’s best institutions, the top offer admission to students without any consideration of their ability to pay, and also meet 100 percent of demonstrated financial need. Among the top 26 national research universities as ranked by U.S. News & World Report – public and private – 23 provide this commitment. UVA, however, is one of only two public universities in the nation that offers need-blind admission while also meeting 100 percent of need for all in-state and out-of-state undergraduate students. The University’s commitment to financial aid is substantial and increasing. UVA projects it will award more than $79 million in grants that do not have to be repaid to in-state and out-of-state undergraduates in this academic year. Need-based grants will assist a projected 3,181 Virginia undergraduates in 2016-17. 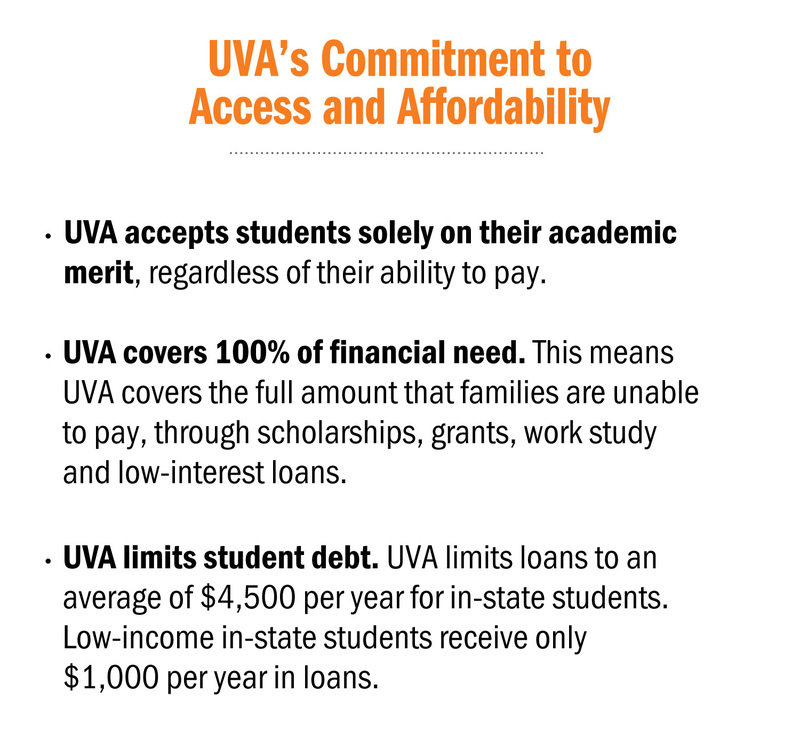 Combined, UVA’s multiyear financial plan and its Affordable Excellence program provide a degree of certainty to the cost of an education on Grounds. Two other components also help address the issue. The University earlier this year announced the establishment of a $2.2 billion Strategic Investment Fund that is projected to award as much as $100 million per year to initiatives that hold the greatest promise to advance UVA’s excellence. The fund could support proposals for new academic initiatives, capital projects, philanthropic goals, health services, research, efforts to increase affordability and access, and more. It also will relieve pressure on Virginia families, as no resources from tuition will be used toward investments made by the strategic fund. Also, UVA continues to generate philanthropic support for both merit and need-based scholarships. Fundraising for need-based scholarships has grown from an average of about $700,000 per year between 2010 and 2012 to more than $8 million per year in cash in 2015 and 2016, with additional commitments in planned gifts. UVA has raised nearly $40 million in support of need-based scholarships since 2005.